The weather poses unique challenges for Worcester Regional Airport (ORH). Imagine that Boston Logan International Airport (BOS) is having an overcast day with low ceilings; Worcester Regional Airport, at the top of the hill, would be enveloped in those same low-lying clouds. In 2010, the city of Worcester turned over ORH to the Massachusetts Port Authority (Massport), which further strengthened its connection to BOS. Although ORH’s proximity theoretically makes it an ideal reliever for the larger international airport, weather frequently gets in the way. 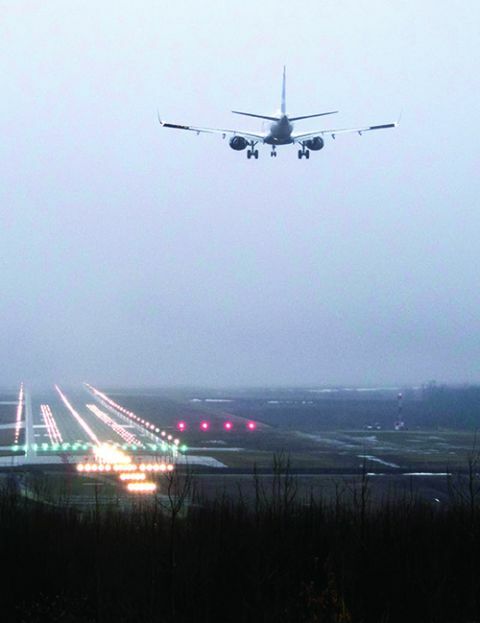 In 2012, the airport petitioned then-Secretary of Transportation Ray LaHood for a Category IIIb instrument landing system (ILS), to enable pilots to land with a visibility ceiling as low as 50 feet above the ground and a visual range ahead of them as short as 600 feet. 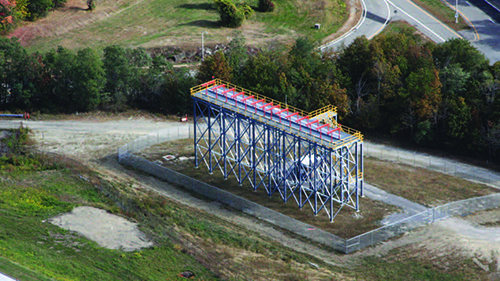 Davis believed a CAT III system would help the airport grow because airlines demand reliability. Later in 2012, LaHood was invited to tour central Massachusetts, and ORH was included on the itinerary; Massachusetts Bay Transportation Authority was installing a rail system from Worcester to Boston for commuters and promoting commercial aviation. Davis asked him if the FAA could see that there was a benefit, and he posed the question on behalf of Massport, “If we could fund [a CAT IIIb ILS] could the FAA manage it?” The FAA said yes. Massport, which owns and operates the airport, authorized funding to upgrade the ILS on ORH’s main runway. In total, the project cost about $32 million, which was paid for by federal grants and the capital from Massport. The airport brought in its longtime consultants Jacobs Engineering Group and Vanasse Hangen Brustlin (VHB) to start working toward permitting and design. Permitting was a unique challenge because ORH is located on environmentally sensitive wetlands within the protected watershed area of the city of Worcester water supply. It was incumbent upon the team to protect the water quality and reservoir. The wetlands location requires the airport to pay particular attention to its wildlife management program. It also meant that protecting the resource area and animal habitat was a priority as the consultants tackled challenges associated with the permitting, design and construction of the new CAT III approach. Crews monitored discharge during rain events of greater than a half-inch to ensure that turbid discharges didn’t affect downstream wetland resources and the reservoir. According to Chamberlain, Jacobs brought together experts in all of the disciplines, routing everything through the FAA, Massport, and the agencies then communicating back. VHB was engaged for environmental impact and erosion monitoring, Green International Affiliates for drainage designs, and J.F. White as the local general contractor. The original plan was to build a new parallel taxiway, which would have replaced five to 10 acres of wetlands. But that wouldn’t be permitted, as it was an unacceptably large area of wetlands to be removed or altered. Chamberlain and the Jacobs team didn’t want to transport a lot of fill through town because it would cause traffic, damage the local roads and disrupt neighboring residents. However, it wasn’t cost effective, and Jacobs went back to the drawing board. Plan B was a retaining wall to minimize the impact to the wetlands; not as much fill was required for this design. The project team also had to address the unique challenge that the grasslands on the airfield support an endangered species called a grasshopper sparrow. The grasshopper sparrow’s nest is an open cup concealed on the ground under vegetation; the birds forage for insects, especially grasshoppers, and seeds in the grasses. Ultimately, the construction had to minimize the impact to the grasses. In order to do that, the team had to reduce the construction zones and schedule around the breeding season. Construction was not halted, but crews had to approach the nesting areas very carefully. Having a good relationship with state resource organizations, the state’s Natural Heritage & Endangered Species Program, and Department of Environmental Protection was a key factor. Because VHB had worked with the organizations before, the consultants knew what was needed to create a plan that would be approved and constructed. As a result, there were no significant delays and all permits were issued on time and on schedule. A standard CAT III ILS requires a full parallel taxiway. However, to save funds and reduce the footprint on the wetlands, the project team came up with a modification: a partial parallel called a jughandle. The jughandle allows Air Traffic Control to safely hold aircraft awaiting departure out of the Runway Safety environment and allowing for the arrival of additional aircraft during low visibility. Timing of the related runway closures was key. Luckily, JetBlue’s two daily flights at ORH are close to each other in the afternoon. 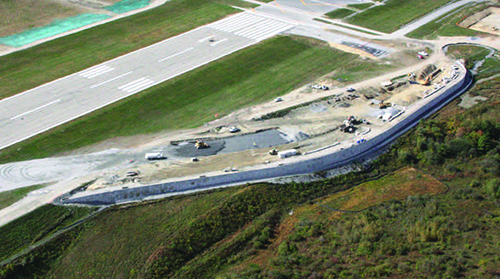 That allowed the airport to schedule construction longer during the day, resulting in longer construction periods (up to 18 continuous hours). “At the sacrifice of having to juggle the contractors, we were able to keep customer impact to a minimum,” says Davis. Along with the instrument landing system, the airport upgraded the existing Runway 11 Medium-Intensity Approach Lighting System with Flasher (MALSR) and ALSF-2 on primary Runway 11-29, which helps approaching planes align vertically with a glide slope indicator that provides information about elevation and angle of approach, and helps approaching planes center on the runway with a localizer. The approach lighting system includes higher intensity lights and sequence flashers to provide visual guidance to pilots during low visibility conditions. The glide slope sends out a radio signal and helps approaching aircraft land. In essence, the glide slope aligns the plane vertically, and the localizer aligns it laterally to help center it on the runway. For the approach lighting system, the plan doubled the number of light towers. The challenge, however, was that several of the existing light towers were in wetlands areas, which meant that some of the new towers also had to be put in wetlands as well. To minimize the footprint of the towers, steel sheeting was driven into the ground to protect the area. Using sheet piling minimized damage and limited impact to about 3,500 square feet of wetlands. By using this technique along the slope with the retaining wall, the team was also able to meet its erosion goals. The new system officially went live March 19, after 2,000 hours of FAA-required testing to certify it. Davis, who has been with the airport for almost a decade, is positive about the outlook. In May, new service with JetBlue Airways will begin to John F. Kennedy International Airport—marking the first significant connector route at ORH in over a decade. Davis says that in October, American Airlines will begin a daily morning flight to Philadelphia International, providing great connecting opportunities to the south and west.